Freedom of choice includes the opportunity to earn unlimited income at your own time. What about an added dose of fulfilment in helping others better their life along the way as well? Being a Public Mutual unit trust consultant (UTC) allows you to live the lifestyle you desire. Join us and see where your talents may lead you. Public Mutual, the No.1* private unit trust company and Private Retirement Scheme (PRS) provider in Malaysia, commands a market share of 49.8%^ for the retails funds sector and 42.5%^ for the PRS sector. Our total net asset value stands at RM66.9 billion^ as at end-April 2016. We remain the “top-of-mind” unit trust brand in Malaysia. Our win in Reader’s Digest Trusted Brand Platinum Award for seven consecutive years (after winning the Gold award from 2006 – 2009) as well as The BrandLaureate award for nine consecutive years is an affirmation of our strong brand presence. We are also supported by 32 customer service centres/branches nationwide. These customer service centres/branches are augmented by more than 255 Public Bank branches which also function as our ubiquitous collection centres. We manage all of our funds in-house with a team of 23 fund managers and more than 30 research analysts. 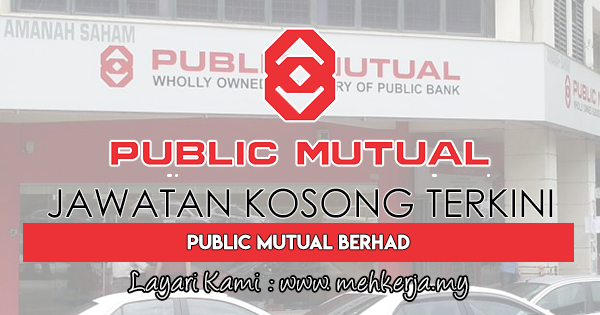 0 Response to "Jawatan Kosong di Public Mutual Berhad - 1 Februari 2018"